pioneer Thomas Little donated land in 1852, the foundation stone for the first church was laid in 1854 by Abbot Salvado, Founder of the Benedictine Abbey at New Norcia, and that church was in use by 1857. It served the Catholics of the district until 1938, when the present “new” church was completed – itself 70 years old, in 2007. St Louis’ Church in Boyanup dates from the early 1900’s, and is the second church within the parish. 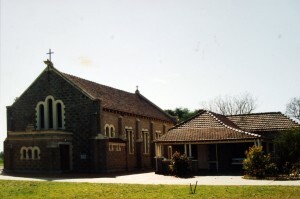 In 1979 the old church was restored and transformed into a Hall; it was named for benefactor Thomas Little, and is currently in daily use by the students at Our Lady of Lourdes Parish Primary School. Between the Thomas Little Hall and the parish church there stands the handsome 1922 building which was the Convent of Mercy and first parish school. It served the Sisters and parish in that capacity until 1974, and was then used for a variety of parish and school purposes. Significantly, in 1977, it became the new home for Carmelite Nuns, brought into the Diocese of Bunbury from Thailand by Bishop Myles McKeon. These Nuns now have their own Monastery in neighbouring Gelorup. The old convent has been beautifully adapted as a Retreat House, and is in constant use. Presently, the Diocese of Bunbury operate Retreat House. We are always pleased to receive guests – of any denomination or none – who may be in need of “time out”, or who may need gentle accompaniment on their spiritual journeys. From time to time formal retreats, usually over a week-end, are conducted. See www.dardanupretreat.com. Weekly Eucharistic celebrations in the Parish of Dardanup are at 7.00 p.m., Saturday Vigil – always at Dardanup – and 9.00 a.m. Sunday mornings – on 1st, 3rd & 5th Sundays at Dardanup and on 2nd & 4th Sundays in Boyanup. Week-day Mass is at 9.00 a.m. each day, always in Dardanup. This Catholic Parish, with its churches of the Immaculate Conception in Dardanup and St Louis in Boyanup, has now been committed to and contributing to the district for more than 150 years, and is currently examining new ways in which it might be of further service in our towns and state. Thanks to Gwen Wells, Parish Archivist, for this research. And to Joyce Hatchett, local artist, for kind permission to reproduce her fine and exquisite paintings.